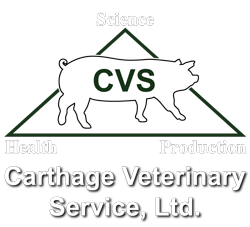 Presented by Attila Farkas, DVM | August 2018 In an effort to continue to keep you informed of the ever changing dynamics of pig production, Carthage Veterinary Service, Ltd hosted a webinar on African Swine Fever on Friday, August 31 from 6:30 – 7 a.m. CST. This webinar provided you with important updates and pertinent information on African Swine Fever. To download a copy of the PowerPoint presentation, please click here.